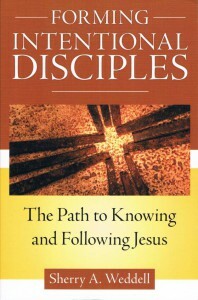 Two weeks ago CatholicMom.com launched a summer book discussion on Forming Intentional Disciples: The Path to Knowing and Following Jesus. The challenge to read a chapter each week includes both individual and parish-wide discussion questions. Meanwhile, CatholicMom writers address the questions every Wednesday. Author Sherry Weddell focuses on the need for Catholics in the pew to be better evangelized; for us to bridge the chasm between Church teachings and a passive personal relationship with God. Even though I'm getting a late start, I wanted to share my personal answers to the discussion questions. There are other personal answers and additional discussion over at the CatholicMom page. Go visit! How would you describe your lived relationship with God at this point in your life? When considering this question, I thought back to my relationship with God during various stages of my life. In my childhood, God was a benevolent father and I learned about his Love for me. The experience of Mass combined with CCE, though seen as an obligation, created a solid foundation for my teen years and shaped my traditionalist “good girl” attitude that led me not to question authority. College years were a time when I learned more about Philosophy than religion, and I grew away from a personal relationship with God. I learned to question authority, to question my foundational beliefs, to consider being spiritual without being religious. I attended Mass and prayer sporadically, largely to find comfort in an unfamiliar confusing time. When dating and considering marriage, not being involved in a strong church community made it all too easy to succumb to the “if it feels good” worldly view, although tradition still grounded me to marry in the church. My personal relationship with God could best be described as a distant relative. I continued attending Mass because I found comfort in the ritual and tradition. I believed and had faith the BIG PICTURE without being part of a parish community. However, I loved our parish priest. His pre-wedding counsel re-introduced the solemnity of the Sacrament, while his short, on point, relevant homilies drew me more thoughtfully into the Mass. Parenthood changed my relationship with God in two ways. Having children required that I be able to explain what I believe, teach the traditions, and pass on the comforts of my faith. To do that required that I know my faith. I enrolled my daughter in little church, CCE, Catholic school. I learned alongside her, reading her CCE books. I began to seek the knowledge, history, truth, and teachings of the Church in order to answer her questions. I also experienced a parent’s love, one that often overwhelmed me. After my second daughter was born, I found myself relating for the first time not only to my parents and how they loved all their children, but also to God and his love for us. All of us. Without competition. Without hesitation. What does the word “discipleship” mean to you? Discipleship calls to mind the early followers of Christ, not the Twelve Apostles, but those who had passing encounters with Jesus and were magnetically drawn to follow him. I also yearn to be a disciple of Christ. I’m learning to follow Him, to leave behind past confusions , to trust Him, to allow him to draw me away from worldly distractions and focus on the fullness of God’s new covenant. As a disciple I’m on a journey toward Him. And I have a long way to go. Do you perceive a need in the Church today to help lay Catholics become more fervent followers of Jesus Christ? Each Parish is faced with the challenge to build a community of disciples. To meet this challenge they need to appeal broadly at every stage of the individual’s journey to Christ. Thru homily, group study, prayer, religious education, and spiritual direction, the parish should be inclusive and welcoming. But ultimately the individual must hear God’s call and start their journey with the destination of becoming in communion with Christ as their goal. Pick up a copy of Forming Intentional Disciples, visit the Lawn Chair Catechism weekly, and walk with us this summer.